Ernest Pridmore was born in 1886 in Radford, Nottingham2, one of 11 children born to Charles and Louisa (née Coulton) Pridmore. Thomas William worked as a labourer and moved to Beeston with his family some time in the years prior to 1901. In that year, the family was living at 87 Gladstone Street, Beeston. Ernest, aged 15, was working as a lace bleacher3. Charles died in 1905 and Louisa in 19134. At some before 1911, Ernest Pridmore enlisted with the 1st Battalion, Northumberland Fusiliers. This battalion had served in South Africa, moved to Mauritius in May 1903 and to India in February 1906. In 1911, Private Pridmore was with the regiment in India, taking part in the defence of the North-West Frontier5. In November 1913, the regiment returned to England and to Cambridge Barracks in Portsmouth. When war was declared on the 4th of August 1914, ist Battalion, Northumberland Fusiliers was amongst the first regiments to leave for France, assigned to the 9th Brigade, 3rd Infantry Division. After sailing from Southampton, it landed at Le Havre on 14 August 1914. In the early months of the War, it took part in the Battle of Mons, the First Battle of the Aisne and the First Battle of Ypres6. 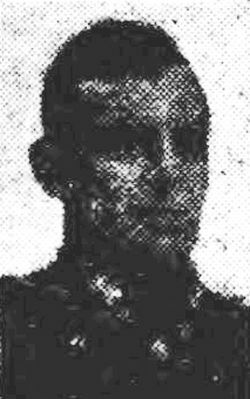 In the Battle of La Basee in October, Pridmore, now Lance-Corporal Pridmore, was wounded but was able to return to his regiment after treatment7. On 27 March 1916, the Battalion was part of 9th Brigade when the latter formation attacked heavily defended positions around St Eloi, three miles south of Ypres. Following the detonation of several mines under the German lines, the attacking troops rushed to take the craters. Although the Northumberland Fusiliers' initial advance went well, the general attack eventually became bogged down in the waterlogged landscape. Fierce German counter-attacks followed and the craters remained in enemy hands when the attacks were finally called off in mid-April8. It was in a subsequent action in this area, south of Ypres, that Lance Corporal Pridmore was killed in action. He was buried in Reninghelst New Military Cemetery. Reninghelst New Military Cemetery is located 9.5 Kms south west of Ypres town centre, in the village of Reningelst (formerly Reninghelst). The village of Reninghelst was occupied by Commonwealth forces from the late autumn of 1914 to the end of the war and was sufficiently far from the front line to provide a suitable station for field ambulances. The earliest burials took place in the Churchyard, but in November 1915, the New Military Cemetery was opened. It remained in use until September 1918. 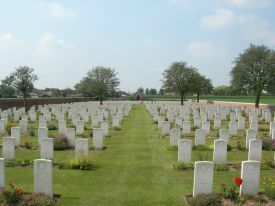 There are now 798 Commonwealth burials of the First World War in the cemetery9. Lance Corporal Pridmore was posthumously awarded the 1914 Star, British War and Victory medals10. 2His birth was registered in Radford Registration District in Q1 1886 (Ref 7b 303). 31901 Census for Beeston, Notts - Piece 3152 Folio 70. 4Deaths registered in Basford Registration District (of which Beeston is part) in Q4/1905 (7b 102) and Q2/1913 (7b 249), respectively. 51911 Census of Military : India - Piece 34987 RD641. 6Based on details included in https://en.wikipedia.org/wiki/List_of_Northumberland_Fusiliers_battalions_in_World_War_I#1st_Battalion. 7His injury was mentioned in the Nottingham Evening Post on 12 June 1916, following his death. 8Based on details included in www.nam.ac.uk/online-collection/detail.php?acc=1998-06-181-7.